So, while Barney’s ear isn’t bleeding like a stuck pig like before, any time he flicks it, it does begin to bleed a bit. 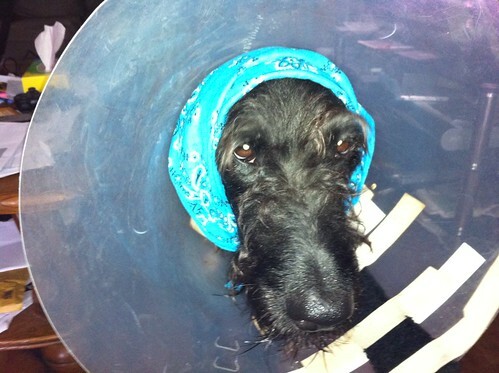 So in order to try to solve this problem and still allow his ear to ‘breathe’, I decided to use a bandana. When I had long hair, my bandana kept my hair from flopping about even when running around and diving all over the place…hmmm…maybe this would work for Barney too! Yes. Poor Barney has to wear an Elizabethan collar because he licked himself too much and caused two sores on his back right leg as well as began to do it in other areas. So he has to wear this for one week. Right now he won’t come near me. He’s look at me as if I am from hell. Not what you want at the beginning of a relationship. Poor guy.